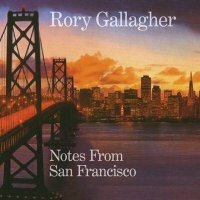 This double CD set is yet another welcome release to celebrate the phenomenal talent of the late Rory Gallagher. CD 1 features the first ever full length release of the abandoned 1978 album. 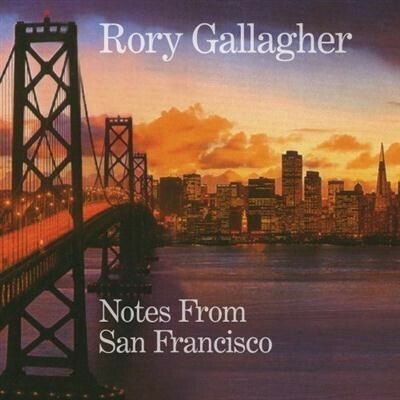 Recorded in San Francisco (as the title suggests), at His Master's Wheels Studio, the album retains the quality of Rory's albums of the seventies, and would clearly have been a great follow up to 'Calling Card'. Featuring the classic 'Brute Force And Ignorance', the rollicking 'Rue The Day', the funky 'B Girl', plus gentler moments such as the sublime 'Wheels Within Wheels' and 'Overnight Bag', there is clearly something here for every Rory fan. Many of the tracks have been available for some time, whether they be as bonus tracks on prior reissues, or appearing on compilations, but it is still great to hear the songs on the album that they should have been on in the first place. Bonus tracks come in the form of an alternate take of 'Wheels Within Wheels', and two tracks recorded at the same sessions, 'Cut A Dash' and 'Out On The Tiles'. CD 2 is the real selling point though, being a live recording of a show at The Old Waldorf in San Francisco, and featuring his usual rhythm section of Gerry McAvoy on bass, and Ted McKenna on drums. The band tear through an awesome set of Rory classics. How can you go wrong with a gig that opens with the 'Follow Me' and 'Shinkicker'? Rory and his band shine on stage as always, and the usual favourites 'Bought And Sold', 'Tattoo'd Lady', 'Shadow Play' and 'Bullfrog Blues' are all present, and played with the energy and virtuosity you'd expect.